A cake-like viscous lava dome is slowly growing at the summit crater and produces occasional incandescent avalanches and rockfalls. During phases of more intense activity such as around mid-late November, regular small to moderate explosions, occasional pyroclastic flows and short-lived lava flows occur (last on 20 Nov). A new lava flow is active on the upper NW flank of the volcano, originating from the base of its lava dome. Likely, the flow started in mid to late October; on 19 Nov, it had a length of less than 1 km. Activity at the volcano continues with little changes. Occasional small explosions are being reported to occur from the active lava dome in the crater. Mild activity consisting of occasional small explosions, characterized as "moderate" by IGEPN, continues at the volcano. Most of the time, the volcano is hidden in clouds and this activity is inferred from seismic signals. Seismic activity reflects frequent explosions and tremor, but visual observations are often not possible due to frequent cloud cover. IGPEN characterizes the activity as "moderate". 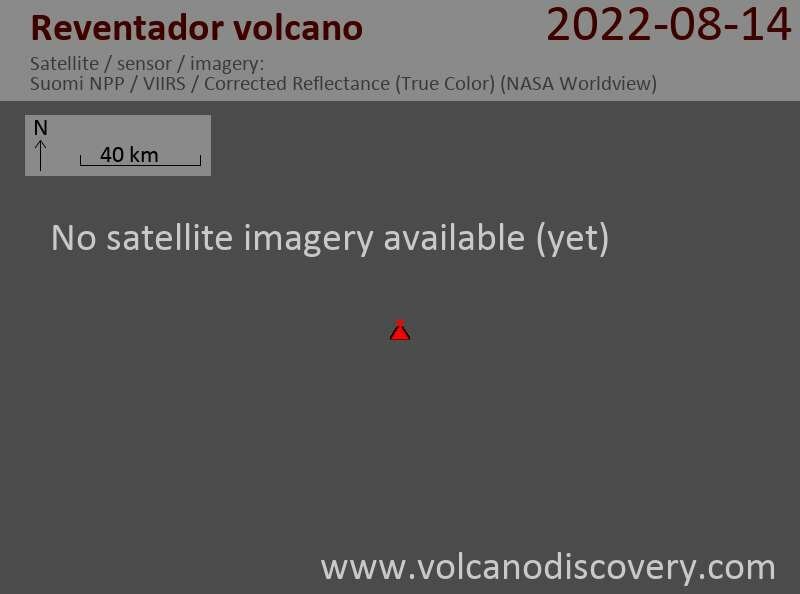 The volcano's activity at the present does not pose a risk for the closest inhabited areas approx. 8 km away. Intermittent small explosions continue as well as slow lava extrusion at the summit, evidenced by thermal hot spots visible on satellite data. Before and after, several smaller explosions also occurred as well. The current series of eruptions has been accompanied by an increase in seismic activity since last night. The observatory mentions moderate activity with continuing intermittent small explosions and ash emissions. A thermal signal on MODIS satellite data shows hot deposits in the crater and on the upper eastern flank, indicating that fresh magma continues to arrive at the summit. Effusive-explosive activity continues at the volcano. Small ash eruptions occurred today and weak lava effusion on the upper flanks of the cone can be seen on thermal webcam imagery. A moderate explosion at the volcano produced an ash plume that rose to flight level 210 (21,000 ft / 6.5 km altitude), a pilot reported. Weak to moderate effusive and explosive activity continues at the volcano. Cloud cover prevents direct observations most of the time, but the seismic signal shows tremor and explosion signals. A thermal hot spot indicates that lava continues to build up at the summit lava dome. The lava flows on the slopes of the summit cone are no longer active, but intermittent explosions of small to medium size continue to occur. The activity of the volcano had increased during the past two weeks, producing several lava flows and some relatively strong explosions. At the moment, it has decreased again, but remains moderately high. Explosions have become less frequent and the lava flows are only weakly alimented. The volcano's activity remains moderate to high, with continuing sporadic explosions. Cloud cover has prevented direct observations most of the time. Over the past weeks, the volcano had been in a state of mild intermittent strombolian explosions, but experienced a rapid increase in activity yesterday after around 15:00 local time. Infrared webcam images (collected by Culture Volcan) suggest that a phase of lava fountaining or much stronger strombolian explosions took place. The apparent surge in lava emission also seems to have produced a new lava flow about 3-400 m long. This increase in activity is clearly visible in the corresponding seismic signal and likely continues at the moment. The volcano continues to produce small to medium explosions with ash plumes rising up to 1.5 km. A MODIS hot spot indicates the presence of fresh lava at the summit, but there seems to be currently no lava flow. Most of the time, the volcano is in clouds and only occasionally allows direct observations. Reventador and the camp in San Rafael, both near the volcano. Noises from moderate explosions were heard. Seismic activity has remained at high levels, showing continuous tremor and emissions signals. IGPEN reports that the pyroclastic flows on the E, SE and S flanks have traveled up to 1.5 km from the summit. Additionally, there seems to be at least 2 lava flows that descend the south-eastern and eastern flank of the volcano, with fronts reaching approx. 500 m distance. Small pyroclastic flows descended on the eastern, southeastern and southern flanks of the volcano, probably as a result of re-mobilization of fresh lava and tephra deposits. These so-called secondary pyroclastic flows reached lengths of 500 m below the summit. Intense degassing and occasional weak explosions with ash emissions probably continue, based on the more or less unchanged moderately intense seismic activity. Visual observations were not possible over the past days due to cloud cover.